Analog Devices has announced today a new sensor interface IC that enables the next generation of intelligent electrochemical sensors. According to the company, it is the only solution available to incorporate potentiostat and Electrochemical Impedance Spectroscopy (EIS) functionality on a single chip. 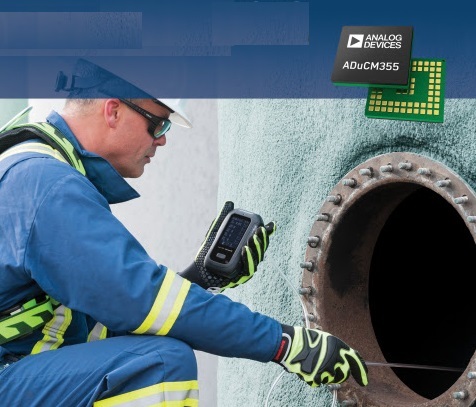 The ADuCM355 precision analog microcontroller with bio-sensor and chemical sensor interface is well suited for applications such as industrial gas sensing, instrumentation, vital signs monitoring and disease management. The ADuCM355 is an ultra-low power precision analog microcontroller based on the ARM Cortex M3 processor especially designed to control and measure chemical and biosensors. It is the only solution available that supports dual potentiostat and >3 sensor electrodes. View the ADuCM355 product page, download data sheet, order samples and evaluation board. : www.analog.com/ADuCM355. Available now, the ADuCM355 is priced at $5.90 (1,000s).